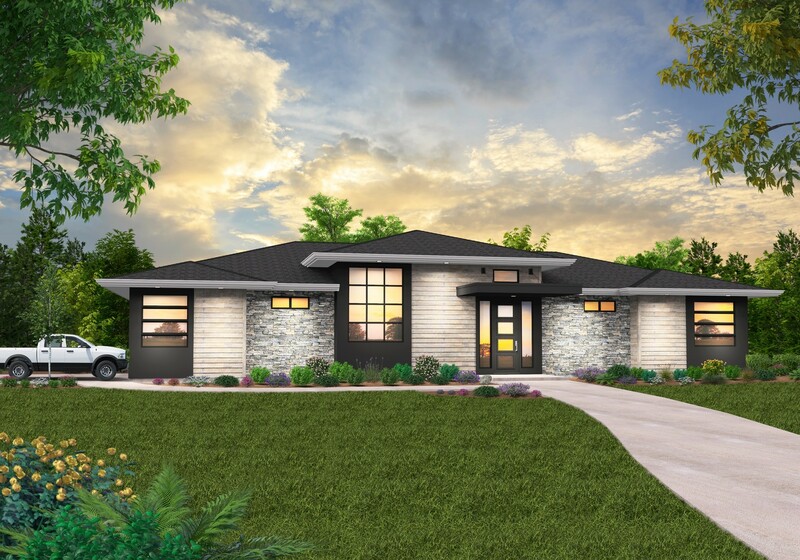 This beautiful prairie home has everything you could want, and we’ve done it in a single story. Enter through into the foyer and find yourself looking out through the dining and great rooms to the lovely covered patio and backyard. A pocket door off the foyer offers quick and easy access to the stunning kitchen. This door allows you to control on a whim how connected you want the entrance of your home to feel. Head straight and find yourself in the vaulted great room which includes a large fireplace and a large space for built-ins. To the left of the great room you’ll see the garage access, the utility room, a full bath, and the second bedroom, the only one on this side of the home. The right side of the home is where we’ve positioned the master suite, as well as a retreat room and a full guest suite. The master suite is truly spectacular, and it should be easy to see why. The master bath has tons of room to spread out and includes his and hers sinks, a large surround walk-in closet, private toilet, and standalone tub and shower. The piece de resistance of the master suite is the private covered patio at the back, which has a fireplace, hot tub, and tons of room for a furniture set. Exciting vaulted Great Room Design.